Mobile homes or manufactured homes are fabricated in a factory and then delivered and placed at the location, unlike regular homes that are built on site. It used to be that manufactured or mobile homes were quite basic but these days you can get some very elegant and beautiful manufactured homes. The range of mobile homes in quality, features, and style vary significantly. 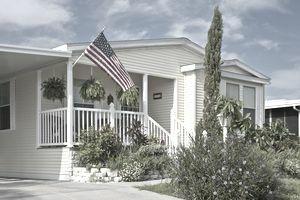 Trends and consumer demand have created new needs for many types of mobile home, such as environmentally friendly manufactured homes, as just one example. Mobile or manufactured homes do not have foundations, they are portable. Although you may not notice the difference when you are living in a mobile home, vs. a regularly constructed home, there is a difference in the insurance coverage. One key difference in a mobile or manufactured home vs. a standard home insurance policy is that you may need coverage during transportation. A standard home insurance policy doesn't cover moving a home from one place to another. Standard car insurance doesn't cover the mobile home in transport while it is being towed to the new location either. Your mobile home insurance provider will be able to help you figure out if you need this coverage and can explain your options. This kind of coverage would never be included in a standard home insurance policy because a traditional home is not usually meant to be moving around. Another key difference is that before the home is delivered, the land may have to be prepared for the mobile home installation. Then, once the home is delivered, it may not already have all the electricity and plumbing set up, so there will be a standard time period for which the mobile home will need to be brought up to the living standards by installing finishing touches. By talking to your insurance representative who specializes in mobile homes, you will get the best protection and good advice on how to cover these situations. You will also know how to work with your mobile home manufacturer and contractor in preparing properly while protecting yourself. Tip: When getting quotes for mobile home insurance be sure and declare how your mobile home will be used. The coverage options and pricing for rental homes, vacation homes, seasonal homes, or homes used as a primary residence may be different. Coverage from Earthquake, Flood, Hurricanes and windstorm coverages or restrictions. Ask your insurance representative what is included in your policy since mobile and manufactured home liability coverages can be different than the standard home policy. This list doesn't include everything because insurance coverages and availability of coverages vary from state to state, however, this list is a good starting point to review some aspects of your mobile home coverage. For example, as you shop around, you might see something called a "Matching Siding Endorsement". You would never even think that in the event of a claim where there is a partial loss, you might not be able to get siding to match the remaining part of your house, but this is exactly the kind of thing you want to ask about and look out for by asking questions. Always ask your insurance representative if they have any other coverages to offer you. Many of the major insurance providers have special programs for Mobile or Manufactured Homes. You should consider checking with a few companies to get the best price and coverage. You can check with your current home insurer to see if they have a special program and also consider companies specializing in mobile home insurance as well. This is a list of some of the companies that may be able to provide you with Mobile or Manufactured Home Insurance with links to their websites. It's a good starting point to get quotes. Included in this list are some of the commonly referenced insurers, there may be other local insurers in your region, so be sure to check around in your area or ask other mobile home owners what their experiences have been or if they have any insurers to recommend. You don't need to go directly to the insurer to get a mobile home insurance quote. Independent insurance agents or brokers can also help you by checking with different insurance companies on your behalf. For example. TrustedChoice offers some information on their website, with referrals to independent agents as well. If you are stuck and need help, you can also contact your State Insurance Commissioner's Office. When shopping for your mobile home insurance you should ask about what the basis of claims settlement is on your policy. Ask whether the coverage on your home is Replacement Cost for both total and partial losses or Actual Cash Value on partial losses. Tip: Ask how the value of the home is determined, over time will it depreciate? Some insurance policies will cover your manufactured home on a Replacement Cost Basis for total losses, or a major catastrophe, but then will only cover you for actual cash value for a partial loss. This is a very big difference. Learn more about Actual Cash Value vs. Replacement Cost. The cost is to upgrade your policy to replacement cost may not be very expensive and can save you thousands of dollars if you have a major claim. When you get your quote for mobile home insurance get quotes for different levels of coverage. It may be tempting to just ask for the cheapest price, but the best coverage may not cost much more than the "cheapest" option. Use the lists above to help you figure out what coverages you need and compare your options to find the best protection for your investment in your home.